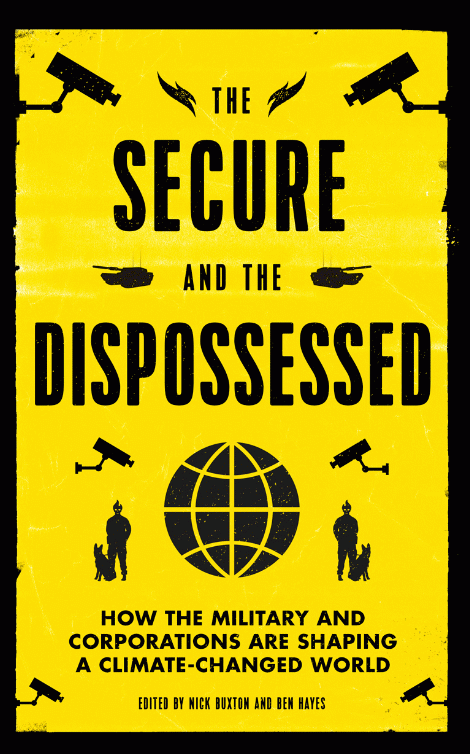 In The Secure and the Dispossessed, Nick Buxton and Ben Hayes have collected an unflinching survey of a species gone mad. The book's subtitle is "How the Military and Corporations Are Shaping a Climate-Changed World." In short, the Authoritarian Exceptionalist Military Corporate Complex is flamboyantly recognizing the hole it is in, and exponentially increasing the rate of digging, while hiring PR firms to redefine "digging" as "robust engagement in advanced resilient green initiatives that save us all by further enriching the rich, militarizing the world, and rendering the earth uninhabitable." The contributors to this book confront the idea that surviving in a further climate changed world is unrelated to surviving in the world we have right now. Avoiding the need to reform the most destructive practices now engaged in, they suggest, is not the surest path to useful future innovations. In fact, it exacerbates future crises. Out-of-control corporate crony capitalism and militarism are problems that must be addressed now and ever more so as the natural environment collapses. War and disaster capitalism are not produced by environmental or economic or refugee crises, quite the reverse. Climate crisis could produce greater social unity and sustainable practices if those are what we choose to respond with. Corporate and military greenwashing should be powerwashed with facts. Wal-Mart's renewable energy goal is set to be actually reached in about 300 years. The U.S. military's supposed greening consists mostly of token moves toward non-green nuclear energy and bio-fuel "alternatives" dwarfed by such leading threats as a massive new investment in nuclear weaponry. Exxon Mobil now possesses more oil that the human-friendly climate can survive, and Exxon Mobil is focused on finding more. The proxy wars of the previous cold war ravaged social cohesion while killing 20 million, injuring 60 millions, and making 15 million people homeless. Rex Tillerson, one of the supposed "adults" keeping Trump under control, has said that climate crises for agriculture are no problem at all, as people can simply change the locations of the farming of various crops. Scientists do not agree with him. Following the BP oil gusher in the Gulf of Mexico, insurance companies have been offering reputational-risk insurance, meaning the provision of public relations services to sell a false but preferable image of a corporation following its creation of a widely known catastrophe. As climate change creates weather extremes, weather extremes create greater energy use, which creates greater climate change, which opens up previously inaccessible northern fossil fuel supplies, which can be used to create both greater climate change and energy use, as well as military conflicts, which are the biggest energy user there is -- militarism creating a level of energy use that guarantees much greater climate change, which a militarized academia is establishing as a "cause" of militarism. I'm fairly certain that our Mentally Deranged Dotard in Chief could not find his way out of these loops with a headlamp and a smartphone even if he wanted to, which would have to follow his admitting they exist. Part of climate-change denial is results-of-climate-change denial. And that's best accomplished by keeping problems out of sight. Two years ago, UK representatives at the EU suggested that rescuing drowning refugees from the Mediterranean would only encourage more refugees. Rather than refugee aid, the biggest industry to have grown out of the recent crises of mass fleeing from Western-driven-and-armed wars has been border walls, fences, guards, and weapons. People are being kept where they will die. Cameras are being kept where they won't see. This is part of the story of the current genocide in Yemen. Another part is the reluctance to tackle famines or disease epidemics when they've been produced by "successful" drone war and wider war in amicable partnership with a friendly vicious monarchy. And that problem is part of the wider problem of the massive arms-for-oil trade what takes place between the wealthy warmongering permanent members of the UN "Security" Council and the oil-rich dictatorships. Another part of climate denial, pushed in great part by the same people who engage in climate denial, is the pretense that climate change (now admitted as quite real) can be solved through such insanities as filling the sky with sulfuric acid. Because the Harvard scientists pushing this "geo-engineering" madness have not tried it out on numerous uninhabited planets, most uncorrupted scientists suggest we'd be very wise to not try it out on ourselves, but rather to ban geo-engineering tests right away -- and to focus on reducing the ongoing destruction of the climate. Why do we not hear these pressing arguments everywhere? Here's part of the answer. The Nature Conservancy lists the U.S. military as a "Partner in Conservation." The National Resources Defense Council "partners" with the military. Conservation International helps weapons dealers greenwash, and was exposed by journalists posing as representatives of Lockheed Martin who asked purely for dishonest cover of destructive practices. The Sierra Club dropped out of a coalition effort I was part of when it found out that an organization involved in the coalition opposed drone murders. When I invited representatives of environmental organizations to take part in a conference last month on war and the environment, Greenpeace gave me a completely nonsensical refusal, while 350.org reluctantly signed on, then dropped out, then agreed to come, then called in sick.